Droid — cool and fresh PSD template for effective mobile app presentation. Use of smart and vector objects allows to easily change the design according to your requirements. Placeholders will let you easily identify the image container and change it. Template files based on Bootstrap 3 with 1170px grid. 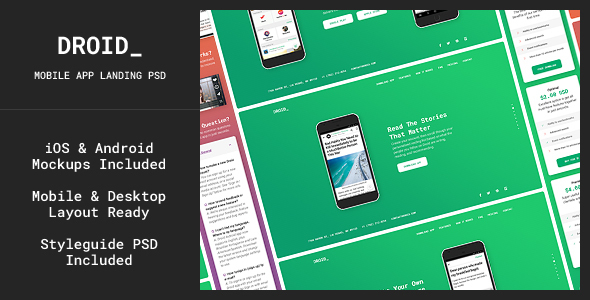 All layers in this PSD template have its own borders with appropriate size. You can use “Move Tool” (V) to select text labels. Then simply hold CTRL to see spacing above and below the label. No need to use “Ruler Tool” or “Select Tool”.